How Many Presidents Does It Take to Deport 11 Million People? There’s nothing realistic about the deportation fantasies of Donald Trump and Ted Cruz. But that doesn’t make them any less terrifying. In 2006, when I first began researching deportations, George W. Bush was president and quietly building a deportation machine in the Department of Homeland Security. 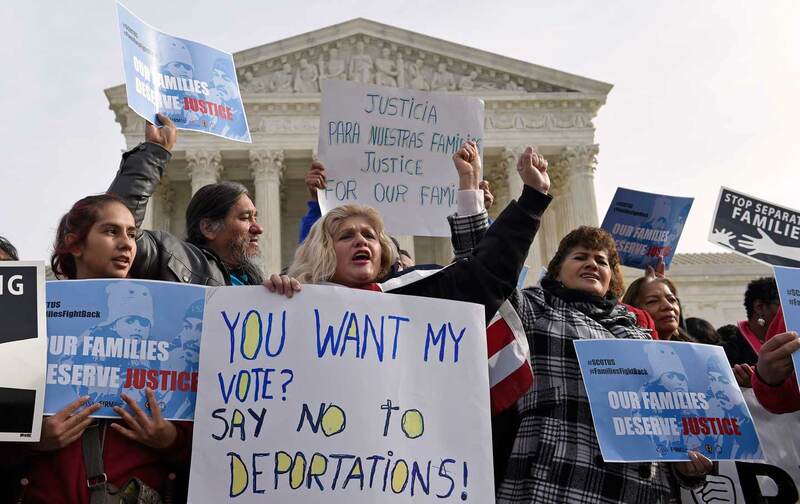 Outside of small activist circles, few Americans knew that deportations had been rising since 1996 due to legislation signed by President Bill Clinton. Nor could anyone then have imagined that the next president would be a Democrat, the son of a Kenyan immigrant, and would make Bush look like a piker when it came to record-high deportations. Nor, for that matter, would anyone have dreamed that deportation would become a—possibly the—signature issue of the 2016 presidential campaign. To put all this in perspective, here’s the crucial thing you need to understand: With such “proposals,” we have been plunged into a grim fantasyland. You can be guaranteed that neither of these men has spent a serious moment considering what it might really mean to deport those 11 million actual human beings. Behind such a program there can be no real plan, because it would prove both unaffordable and unworkable (leaving aside its utter inhumanity). Undoubtedly, neither Trump nor Cruz cares about the details of all this, since the point is to arouse deep fears of loss and visceral betrayal in the white working-class voters they want to attract. But it’s worth taking their proposals seriously enough to ask a relatively straightforward question: Is it feasible to deport 11 million people? Keep in mind that those 237,941 undocumented immigrants expelled from the country represented a far higher number of deportations than had ever previously been experienced. Before 1995, there were never more than 50,000 total removals (including people caught crossing the border). Only in 2003 were figures for interior and border removals reported separately, at which time there were 30,000 interior removals. A concerted effort in the years that followed would translate into a sevenfold increase in the number of interior removals during the Bush presidency. When President Obama took office in 2009, he topped the Bush numbers, overseeing record deportations and keeping interior removals steadily above 200,000 until 2012. Then those numbers began to decline, dropping to a still hefty 69,478 interior removals in 2015. For his early deportation record, Obama earned the title of “deporter-in-chief” from immigration activists, as well as the ire of the Latino community. Perhaps due to pressure from that community, he has in recent years rolled back deportations, in addition to issuing an executive order that grants temporary authorization to stay and work in the United States to immigrants who came here as children. He also issued another executive order that would grant the same protections to their parents, although it is still held up in the courts. Now, for the future: the promise to deport all 11 million undocumented migrants in, assumedly, two four-year presidential terms would mean the deportation of 1,375,000 people annually, or six times that all-time high of 237,000. In other words, Donald Trump or Ted Cruz would have to almost match Bush’s sevenfold increase in deportations on a truly monumental, essentially inconceivable scale. The more realistic question in the grim world of deportations would be: Could one of them even get back to the 237,000-a-year figure? It’s far from clear that any president could actually restore such record-high deportation rates today (forget the promise of millions). As it happens, ramping up deportations again would require cooperation from local criminal law enforcement, which is unlikely. In reality, local police departments have been moving away from such cooperation over the past few years, in part due to criticism that such programs encourage racial profiling while diminishing trust between communities and the local police. The dramatic increase in deportations under President Bush relied heavily on increased cooperation between local police and ICE, due to real limitations on the ways in which immigration laws can be enforced. Whereas local police officers are empowered to patrol the streets and arrest people suspected of committing crimes, immigration law–enforcement agents are not authorized to pull people off the streets simply because they suspect they might be undocumented. An important reason for this: There is no way you can figure out a person’s immigration status simply by looking at them. How, then, are 5,000 ICE agents, or even 15,000—the number Donald Trump wants—going to deport more than a million people annually? In reality, there is no way that those numbers would be enough to arrest and expel the nearly 4,000 people a day, or 1,460,000 people a year that Ted Cruz implies he would reach in his presidency. It may seem like 5,000 agents should be capable of arresting at least one person each a day and so meet those goals. But the process is simple only in a Trumpian fantasy world. In the real world, locating and then arresting the undocumented is anything but a straightforward process. After all, ICE agents can’t go around interrogating people to find out if they are undocumented and then sweep them off the streets. They can, however, arrest people in their homes—if they have a warrant. Consider the 2008 Postville raid in Iowa, at the time the largest of its kind ever. Start with the fact that it took almost a year and a half of investigation and planning to pull off. In December 2006, federal agents began to look into a worksite enforcement operation in Postville, a town with 2,273 inhabitants, 968 of whom worked at Agriprocessors, a kosher slaughterhouse and meat-processing plant. On Monday, May 12, 2008, the plan became a reality as 900 agents descended on the town. Cooperation among several federal and local agencies was necessary for this to happen. In all, 389 immigrant workers were arrested, though only half of them were eventually deported. In other words, ICE spent a year and five months working on a case that required almost 1,000 agents on the ground and eventually resulted in fewer than 300 deportations. In sum, President Obama has done about as much damage as is presently possible to undocumented migrants and their families within these legal and judicial constraints. Trump’s and Cruz’s claims that they will do significantly more are baseless—unless the American system were to be changed in fundamental ways (and even then, achieving their goals would prove unlikely in the extreme). In Trump’s far-fetched proposal lurks a crucial irony of our moment: Mexicans are no longer emigrating in large numbers to the United States. Over the past decade, more Mexicans have returned from the United States than headed illegally for it. Undocumented border crossings from Mexico have, in fact, been falling for the last 15 years, in part thanks to a sharp decline in the fertility rate in that country and the consequent lack of demographic pressure for people to leave. And don’t forget that the wall would be a staggering infrastructure project. It would, for instance, require 10 percent of all the cement produced in the United States in a year. And then there’s the issue of the price. It is estimated that just fencing in the full 2,000-mile border would cost up to $25 billion, or a quarter of what the federal government spends on infrastructure annually. An 80-foot, high-tech wall would cost far more. And let’s not forget that infrastructure in the United States is falling apart: Highways are crumbling and mass-transit systems are in desperate need of repair and modernization. Imagine the federal government, spurned by the Mexicans, spending tens of billions of dollars on such a wall when Amtrak, for example, is barely scraping by with an annual budget of $1.6 billion, while other developed countries are leaving us in the dust with 200-mile-per-hour bullet trains. Should Donald Trump or Ted Cruz win the presidency, they are guaranteed to make life hell for millions of undocumented human beings living in and working extremely hard in this country, and their plans would fail dismally—but that failure would undoubtedly prove to be a horror all its own. Tanya Golash-BozaTanya Golash-Boza is an Assistant Professor of Sociology and American Studies at the University of Kansas and a Fulbright-Hays Faculty Research Awardee. She is currently writing a book on discourses of blackness in Peru.